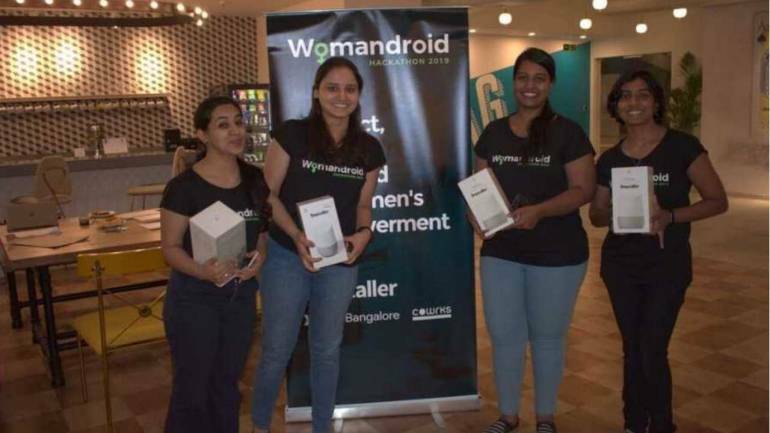 It’s rare to have an all-woman’s hackathon that brings coders to find tech solutions to safety and other issues faced by women, but The Womandroid Hackathon that took place in Bengaluru on February 16 did just that. Harshini, a participant who is a final year engineering student and an intern at Sandisk, told Moneycontrol that she and her team were working on an app that focused on providing more information to women who are new to the technology space. She said that there are three parts to the app they developed. One is where they can find out about women who are well established in the tech space through short profiles on the app. Women are heading their own businesses and coming up with their own startups and there is no dearth of creative ideas. However, when it comes to connecting with the right people to get a job done, women hit a brick wall. Another group developed a mentor app to bridge the gap between women who want to pursue a career, and those who are successful in their respective fields. For example, if a girl in college logs onto this app, she can choose from a list of fields she is interested in. She will then get a list of courses the mentor offers and learn more about the sector she wants to get in. The application aims for a smooth transition from education to work especially for women. The app won the hackathon, which was powered by Truecaller. To facilitate fruitful business relationships and networks, a group of coders at the Womandroid Hackathon developed a networking app especially for women to help them connect with new people and build a community exclusively for women. One of the members of the group, Somya who currently works at Goldman Sachs, explained how the app works. Once a user specifies her interest, the app will help her connect with professionals. They can even block dates for meeting on the calendar and once the meeting is done either virtually or offline, the event will be marked as having been completed. Another group aimed to empowering women from rural India when they decided to develop a healthcare app that would help both expecting and new parents. The app will help these parents connect with healthcare workers, and also has an SOS button in cases of emergency. Other groups worked on applications that focused on helping women discover more women-only events; a community app to help women address thoughts and concerns; an app to review places from a woman’s perspective and even a question-and-answer style advice app for women to ask questions to other members and seek help. The hackathon gave women a platform that helps them identify their interest in technology and how they can make the world a better place for women using tech.